Prime Minister of Armenia Nikol Pashinyan today received the EU-member States’ Special Envoys for the Eastern Partnership. “I am glad to welcome such a representative delegation from the EU member states whose primary task is to promote the vision and the progress of the Eastern Partnership. Partnership with the European Union is of an immense importance for Armenia – especially for the institution building and economic development of our country. The Comprehensive and Enhanced Partnership Agreement (CEPA) is the main instrument of our cooperation, and Armenia is fully committed to its implementation. This is a landmark strategic document, which provides effective mechanisms for advancing both our partnership with Europe and the reforms in our country. We hope that the ratification of the Agreement will be carried out in a timely manner. I am grateful for those countries which have already completed it. But at the same time, taking this opportunity I would like to ask you to convey our request to your governments to expedite the ratification process. As you may know, last year our country and society have undergone through tectonic transformations, which led to the triumph of true democracy. The Armenian society here in Armenia and in Diaspora has fully embraced and supported those developments. Our Government aspires to strengthen human rights, achieve coherent democracy, good governance, the rule of law, independence of judiciary and level playing field for all political and economic actors. This makes us even closer to the values and aspirations that have been put at the heart of the Eastern Partnership. The logical pinnacle of our revolution was the snap parliamentary elections held last December. I am proud that the international observers assessed the elections as completely consistent with OSCE standards, and hailed as democratic, free, fair and transparent. In fact, they were the best elections ever held in Armenia since the first years of our independence. Having finalized the political transformation, our government is currently concentrated on the economic transition. We have to make an economic revolution. We have adopted ambitious reform agenda aimed at establishing a true competitive environment for doing business, improving and simplifying the regulatory framework, eliminating barriers to trade, and attracting foreign direct investment. As one of our priorities we are currently making steps to promote technology and knowledge based economy. Today, the technology sector is one of the driving forces of our economic growth. Information Technologies have huge potential for development in Armenia. They are becoming one of our main comparative advantages and could constitute the corner stone of our economy in the future. In this regard I would like to inform you, that Armenia will host the 23rd World Congress on Information Technology, which will be held from October 6 to 9, 2019, in Yerevan. Hundreds of business community members, academicians and government representatives from a few dozen countries will attend the event. Taking this opportunity, I would like to ask you to share this information with your respective governments to dispatch their representatives to this remarkable event. Implementation of reforms is a difficult process requiring significant financial and intellectual resources. In this regard, the continuous EU financial and technical assistance is of critical importance for us. We highly appreciate it. However, to tell the truth, today we are expecting more support from the EU. 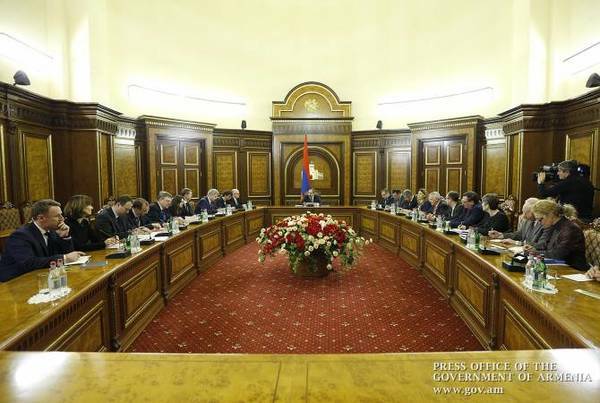 We believe that it should conform with the remarkable democratic achievements registered in Armenia. Please convey to your capitals the message that enhanced EU assistance could accelerate the reforms undertaken in Armenia, and make them more robust and instrumental. Visa Liberalization Dialogue is another important commitment. Armenia has been undertaking consistent steps towards the effective implementation of the Visa Facilitation and Readmission Agree¬ments. And, we hope that the EU Member States will duly evaluate our progress and develop the required Visa Liberalization Action Plan.